Followers of this blog have already heard about major milestones that West Coast groundfish trawl fishermen achieved during 2014. In June, the Marine Stewardship Council recognized the remarkable progress made in this catch share fishery over the last decade, and certified 13 trawl-caught species as sustainable. In October, the Monterey Bay Aquarium’s Seafood Watch program upgraded 21 trawl species to sustainable status, helping to change perceptions and opening up potential new market opportunities for West Coast trawlers. 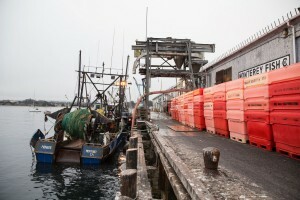 While supply-chain and consumer perceptions gradually adjust to recognize those positive realities, many groundfish fishermen are still struggling to hang on and make a living. Helping reduce their operating costs so that fishing can become more profitable has been a primary focus of our West Coast team, and now we can celebrate a win on that front with the passage of S. 1275, the Revitalizing the Economy of Fisheries in the Pacific Act, also known as the REFI Pacific Act. The REFI Pacific Act reduces the rate of interest that West Coast trawl fishermen pay on their 2003 federal permit and vessel buyback loan from 6.97% to the Treasury rate. Since buyback loan payments are deducted every time a fisherman delivers catch, this interest rate reduction will increase the chances that fishermen can earn a profit in a business where fuel, equipment, insurance and maintenance costs take a huge cut. In addition to those normal operating costs, West Coast trawlers shoulder the cost of federal observers, and a 3% “off the top” fee that goes to administer the catch share program itself. EDF worked closely with our friends in the fishing industry to advance this legislation. The Fort Bragg Groundfish Association, the Midwater Trawlers Cooperative, United Catcher Boats and the Fisherman’s Marketing Association all had their shoulder to the wheel on this issue for a long time. In Congress, Representative Jaime Herrera Beutler (R-WA) and Senator Maria Cantwell (D-WA) spearheaded the final push. These Washington State lawmakers and their staffs, along with Rep. Peter DeFazio (D-OR) and Rep. Jared Huffman (D-CA), and the entire West Coast delegation that supported this effort, have earned the thanks of fishermen coastwide. This entry was posted in Domestic, Pacific, Policy and tagged bipartisan, fishery supply chains. Bookmark the permalink. Both comments and trackbacks are currently closed.